The Classic is ideal for blues, country, and anything else under the 'Americana' label. A versatile tone with wide dynamic range that can be precisely controlled with Vari-Class. Okay, it is cheaper. But the footswitch should be supplied as it is with the other two amps in the range. 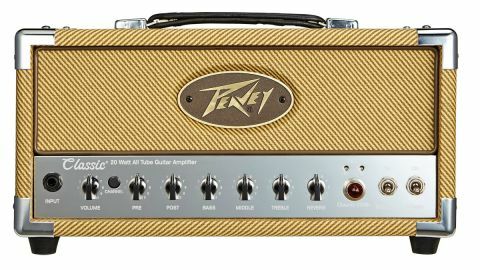 The Classic 20 MH takes Peavey's long- running and highly regarded Classic series and reworks it for the Mini Head format. Again, we have a single input socket feeding a dual-channel preamp with shared EQ, and controls for clean volume, overdrive gain and master volume (using Peavey's old-style pre and post names), bass, mid, treble and reverb. The internal electronics layout and rear panel are identical to the ValveKing 20 MH, with the same speaker, attenuator, recording and headphones output, effects loop and footswitch functions, and the same dual-EL84 output stage. The Classic 20 MH has a more focused sonic palette in comparison to the ValveKing. There's a punchier midrange and an edgier distortion tone, which team well with the dual-EL84 output stage - making a practically perfect platform for country, blues and classic rock. Dating back to 1991, the Classic range is one of Peavey's stalwarts and the tweed covering leaves you in no doubt as to the genres it's aimed at. Driven with the right guitar, the Classic can go from vintage Allman-era Southern rock to an excellent twang that'll inspire any country picker. Strat players can pull the heavier, Buddy Whittington-type of tone from it just as easily as the clarity of Stevie Ray, while for semi-acoustic players, the Classic is almost purpose-built for rockabilly and redneck jazz. Its frequency range is ideally matched with the P-90 and the slightly brighter humbucking tones of Gretsch's Filter'Tron, perfect for Brian Setzer or Danny Gatton styles, although the 20-watt output stage doesn't quite have enough clean headroom for live use, unless its mic'd up. Peavey's manufacturing and design expertise has been fully leveraged with these three heads; they look great and sound very impressive, with power and clean headroom to handle most smaller gigs, and studio-friendly features that make a huge difference when it comes to getting tracks down fast. The price is reasonably competitive, bearing in mind these are all real valve amps and all three heads look and sound anything but bargain basement.